Math, especially geometry, can be a lot of fun. Let’s take nets for example. Nets, in geometry, are a two-dimensional representation of a three-dimensional object. Basically, that means that if you could peel away just the outside of an object and lay it out flat, you would have a net of the object. Think of it like a puzzle – what would a three dimensional object look like if laid out flat into two dimensions and how many ways could you represent it? Vice versa, how can you turn a two-dimensional picture into a three dimensional object? Nets are especially important when beginning to learn about things like surface area and volume. Lots of professions use nets, like architects, designers, artists, and engineers. So let’s make some nets! 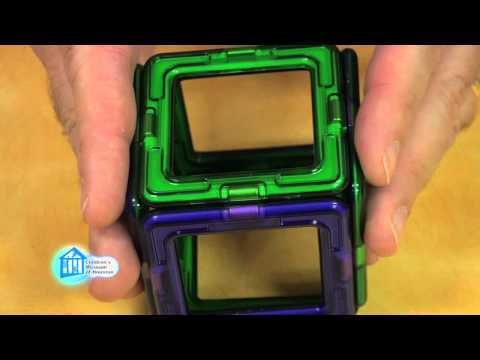 Magformers – this is what we used for our project. They are shapes with magnets in them and are available at the Children’s Museum of Houston Fiddlesticks Gift Shop or online. Or you can cut out your own shapes. The possible ways to do this are numerous. Mostly, have fun and enjoy doing some math!